Hello ajopart, thank you for your comment. It's true that it might be very difficult to place the tetraminos where you want to, and sometimes even frustrating. We are aware of this and other important problems and thats why we won't stop the development of the game here. So, you can expect updates soon in our facebook and twitter. Thanks for the encouragement and thanks for playing the game. I like the concept. Easy to understand and straigthforward. But it's difficult to place correctlythe tetraminos because the camera seems attached to the crab. 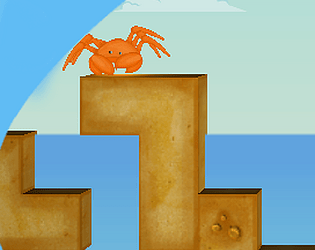 It stops when the crab climbs and suddently move fast when the crab moves.